The most modern way to replace lost teeth is dental implantation, and numerous arguments can be listed for i. However, there are also some counter arguments. This article will present the pros and cons of dental implants. Dental implantation is a modern oral surgical/dental procedure to replace lost teeth. It can be applied when even the tooth root had to be removed. The implant in this procedure is the artificial root which replaces the original root either immediately or at a later time. The artificial root is a threaded screw made of titanium. The dentist inserts this into the jawbone. After a healing period, he fixes a superstructure onto the implant. On this he will then place the required tooth replacement. This can be a crown, a bridge, a cantilever bridge etc. First, let’s see arguments in favour of dental implants. To replace a single tooth, an implant is as good a solution as a bridge. Even a better one. In fact, to fix the bridge, the dentist must grind down the teeth on both sides of the gap, even if they are perfectly healthy. With the use of implants, there is no need for such grinding. Therefore implants protect intact teeth. If a patient has removable tooth replacement – without having any natural teeth in the oral cavity -, this can be made more stable with some implanted artificial roots, even during eating and speaking. This way, the everyday life of the patient will be more comfortable. In case of total tooth loss, solidly fixed bridges or cantilever bridges can be created by implanting more than one implants, therefore replacing the whole upper-lower set of teeth. This solution results in a significantly stronger chewing performance and a greater sense of comfort compared to removable prostheses. Another very important aspect is that the artificial root and the implant built on it are fixed in the jaw. This means that they stimulate the bone and the gum during chewing. This can prevent the atrophy of the jaw and the gum. It also prevents the distortion of the face (which can be the result of facial dilapidation). It also helps avoid numerous diseases and complications related to tooth loss. The successfully fixed (ossified) implant can offer a tooth replacing solution for many decades or even a whole lifetime. The teeth built on the implants bear are like natural teeth, both in appearance and in function. They enable forceful chewing and biting, which has a positive effect on the functioning of the complete digestive system and body. Having seen numerous arguments for the dental implant technique, let’s see the potential risks and complications of this procedure. We will also look at contraindications and cases when it is not possible to perform the implantation. It is not possible to implant an artificial root in case of certain diseases of the immune system and the haematic system, as well as some chronic infectious diseases. Diabetes and smoking make ossification of the implant more difficult in the jaw. As with all surgeries, complications can arise during the implantation of the artificial root, especially inflammation in the soft tissues around the artificial root and in the bone tissue. 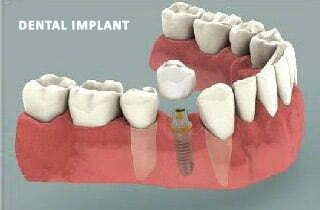 This process can lead to the loosening of the implants or even losing the implant. This process, called peri-implantitis by professionals, can start in the first month after the surgery or later, around the solidly fixed implant. In the latter case, the cause for inflammation is usually overburden, early burden or a lack of effective cleaning. The jaw bone gets thinner around the place of teeth extracted a long time before the implantation of the artificial root. Therefore the substance of the bone is not enough to fix the artificial root. In this case, lifting the paranasal sinus and osteoplasty is necessary before implanting the artificial root. Implants and the prostheses mounted on them require more attention, more effective cleaning and greater care than usual. Otherwise, a foudroyant inflammatory process can occur, which can result in loosening or lost implants. Compared to more traditional methods, this technology is more expensive. Dental implant procedure can be rather expensive in your home country. If you still would like to get access to it in a cheaper way with outstanding quality, contact a dentist abroad. For example in Hungary, the number one country in dental tourism. Here, you can acquire high-quality implants for a price 60% lower than in your home country. The total costs of a treatment in Hungary are just the half of what you would need to pay at home. This is including the price of travel and accommodation. In ACE Dental Clinic’s Budapest office, an experienced and well-prepared team is awaiting you. They will give you a professional offer and a quote within 24 hours. They will also help you with everything connected to your journey, for example reserving your plane ticket or choosing an accommodation. You can ask for a professional offer and the quote through phone or email via the following contact details.